Let Zinger Install Your Wall Mounted Digital Signage! Note: An electrical outlet needs to be close by the Wall Mount. Zinger can provide an electrician if required. Call us for more details. Cable runs are additional. Zinger provides installation services throughout the US. All installations come with our 100% satisfaction guarantee for 1-year. Installations can be scheduled within 24 - 48 hours from delivery of your equipment. 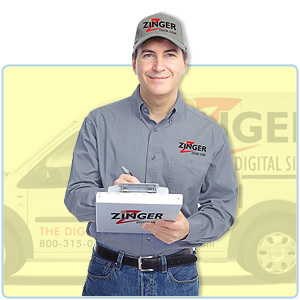 After checkout a Zinger Representative will contact you to schedule your installation package.